Throughout this compelling film, the assassins want to believe they're doing righteous work: they're fighting Nazi occupation forces, after all. "I don’t shoot women," announces Bent (Thure Lindhardt). An assassin following orders from the Danish Resistance in 1944, he's baby-faced and red-haired, not at all the type you'd take for a stone-cold killer. Neither does he have a predictable reason for not "liquidating" women, as his team likes to term his work. It's not that he has moral qualms, exactly. It's that he tried once and failed, fooled by his target's tears and protestations. "She stood there staring right at me and I couldn’t pull the trigger," he recalls, "She cried and cried and cried." The following week, he sums up, she was back to her old tricks, informing on Danish citizens. Bent barely smiles. "I forgot that we're not killing people, we're killing Nazis." Bent tries not to think too hard about what he does. He has that in common with his partner, Jørgen (Mads Mikkelsen), who spends the first hour or so of Flame & Citron (Flammen & Citronen) driving Bent from one mission to another and waiting in the car. Known among admirers and Resistance coworkers by their codenames -- Flame and Citron -- the team is becoming legendary, in spite of their efforts to be discreet. Throughout this compelling film, directed by Ole Christian Madsen and based on a true story, the two men believe they're doing righteous work: they're fighting Nazi occupation forces, after all. Still, they do wonder sometimes how they've come to this place in their lives and what they'll do when the war is over. Until then, however, Flame and Citron see themselves as good soldiers, crusading against "brutal bastards" and scurrilous propagandists who deserve grisly ends. The killers' cause is just, and they're aided in secret by Danish police, vendors, and those few civilians "who are not afraid." As Flame puts it in his voice-over, the Nazis seemed to come out of the dark one terrible night in April 1944, as if "they had been waiting all day." Once visible, they raided homes, disrupted businesses, harassed hardworking citizens. In response, he and his colleagues are efficient and deliberate: Flame strides up the stairs to an apartment, knocks on the door, and, facing his designated target, checks the identification and then shoots, once to the head. He walks back out to the waiting car, looking calm. "If you stay calm," he says, "No one will suspect a thing. People will only be looking at the dead, at nothing else. They won't see you leaving." In between assignments, Flame and Citron live in a basement room, where they play cards, smoke cigarettes or practice shooting. ("Most of my time is spent waiting," Flame explains, as he sits in a tub.) They receive their orders from Winther (Peter Mygind), a police solicitor they don't quite respect, but understand to be directed by British intelligence. As long as they're going after Nazis and known informers, the partners are at peace with what they do; once they are sent to kill Germans -- soldiers or civilians who are not explicitly affiliated with Hitler's party -- Flame and Citron protest... until Winther reminds them of their commitment: "You're Special Forces," he growls, "You'll do as you're told." Still, they've crossed a threshold, where t seems possible to question orders, and so Flame and Citron experience a change -- in their understanding of the mission and their own relationship, at once horribly intimate and utterly abstract. A redefining moment occurs when they are instructed to "liquidate" a woman: Flame balks and Citron runs into his own problems, as she would be his first kill ever. The result -- a scene in which the shooter approaches the target standing at the sink in her own bathroom, then covers her face with his hand as he fires a bullet into her suddenly splattering skull -- is at once stunning and revealing. The work is turning increasingly personal, which means that the workers must think through their own reasons for doing it. Described by one observer as "a soldier without a front," Flame believes himself to be dedicated both to his nation and against its obvious enemies. A potential victim teases him with questions about his hatred of the opposition: if this feeling is "caused by a personal neurosis," the would-be philosopher proposes, "The neurotic is intelligent and he has doubts. If he is betrayed, his hatred fades and doubt sets in. War does nothing for the neurotic." Even as he's contemplating such moral questions, Flame confronts an emotional complication -- in the conventional form of a woman. Ketty (Stine Stengade) is plainly not who she claims to be, a blond-wigged courier married to a gay Swede (so she can travel more easily across borders). When Flame learns she has ties to Winther. He's bothered, but not enough to not fall in love with her. She may be a German agent or a double agent, she may be scheming against Flame and Citron or caught up in business that has her turned around. The question of who's innocent -- and if it's possible to be innocent amid all the ethical turmoil -- is expanded in Citron's disintegrating relationship with his wife Bodil (Mille Hoffmeyer Lehfeldt). Though he tries at first to maintain contact with her -- mainly, pawing at her in the front seat of their car during furtive nighttime meetings -- she confesses eventually that she has "met someone," a man who offers her a chance at a more regular existence. Seeing that she's become afraid of him, Citron is horrified, as if seeing himself in her pale, anxious face. 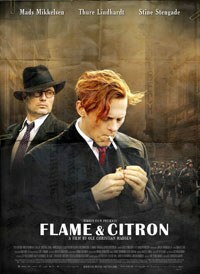 Such difficult emotional interludes help to make Flame & Citron's taut action even more effective. Beautifully choreographed and filmed in deep shadows that cut the violence into shadowy, brutal fragments, Flame and Citron's jobs are at once thrilling and disconcerting. If their dilemmas come to resemble those laid out in Steven Spielberg's Munich (without the weird conflation of maternal bodies and motherlands) or Paul Verhoeven's Black Book (without the splendid surrealish excess), Flame and Citron are in the end grappling with themselves, with their own doubts and ideas about each other. The fact that they are posthumously honored officially by the U.S. -- both are awarded Medals of Freedom -- doesn’t so much seal their decidedly unofficial heroism as it does further complicate it.